Strawberry shortcake is one of those classic recipes that is always a favorite. 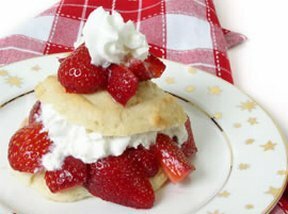 This shortcake is not too sweet, not too filling, and just right for everyone! A perfect way to enjoy the abundance of delicious fresh strawberries this spring. Spring is the perfect time to try all the different ways in which you can enjloy aparagus. See how with our step-by-step instructions. See how to clean, prepare, cook, and freeze strawberries so you can enjoy them at their best.